Stay for Ronolie…and that’s it. It was love at first sight for the commoner, Cho Ching, and the heir to a vinegar business, Chin Tung. 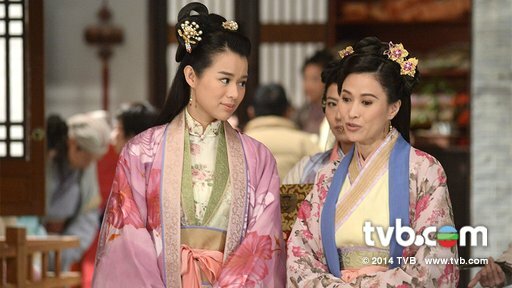 But their fairytale quickly ends after their marriage when Cho Ching is unable to get along with her new husband’s family. The Chin family tries to set up Chin Tung with his personal maid, which only causes more friction between him and Cho Ching. When she can’t take the jealousy anymore, Cho Ching schemes with her friend, Gai Jun, on how to keep her husband to herself. Ronolie starring in a comedy? YES. I will be there on premiere night, for sure. Actually, I would probably watch anything that Ron Ng and Myolie Wu co-star in because they are two of my favorite TVB actors and definitely my fave TVB “couple.” Since Lady Sour was airing at the end of the year and after all the anniversary dramas, that was already a sign that this wasn’t gunna be all that great. I didn’t care though because my love for Ronolie trumps the inevitable, which was that this drama will be a big ol’ waste of time. My suspicions regarding Lady Sour‘s quality and success, or lack thereof, were ultimately confirmed. Even so, I have no regrets watching it because I was legit only in it for the classic Ronolie charm, and there was plenty of that. Right off the bat, Lady Sour‘s story already sounded unappealing on paper. Vinegar business? Jealous wife? Blech. Those things just sound terrible and literally have nothing in common with each other. And let’s not forget that it’s a comedy. Yeah, not diggin’ it. Maybe it could have somehow worked as a melodrama, but that would still be a stretch of the imagination. Throughout the 20 episodes run, Lady Sour couldn’t reconcile those two very separate and distinct plotlines, so it seemed like there were two different dramas happening at the same time. I really wanted the drama to just focus on the story between Myolie and Him Law’s family, but they would insist on spending copious amounts of time on teaching us about the vinegar business. As a result, the plot would take one step forward but then two steps back because there was such a disconnect within the story. I may have been watching Lady Sour solely for Ronolie, but of course there were still plenty of supporting characters that had to be dealt with. Him Law and Eliza Sam’s characters were tolerable because they were integral parts to the story, but all the other peripheral characters were totally unnecessary. I hated the parts of Lady Sour where they would try to give those characters their own plotlines because it was such an unwelcome departure from the main story, which already wasn’t that good. If the writing for this drama was better, some of those characters may have been successful as “loveable misfits” and some much needed comic relief in this mostly unfunny comedy. Alas, the writing was not good, so these characters ended up being unnecessary background props. But enough with the failures of this drama, let’s talk about why people would actually want to watch Lady Sour: Ronolie! I personally think that Ron and Myolie are two of the more well-rounded TVB actors because they can pull off both drama and comedy. If you asked me though, I still prefer them in comedic roles because that’s where I think they really shine. Their last comedy collaboration was the 2009 comedy, A Chip Off the Old Block, which also happens to be one of my all-time favorite dramas. Coincidence? I think not. With Lady Sour, however, the writing was just so not funny, that neither Ron nor Myolie were given the material to show off their comedic skills. They both definitely brought the charm and adorable goofiness that I associate with them in these types of roles, but it still wasn’t enough to highlight their characters or the drama itself. The ease and comfort between Myolie and Ron are obvious in their shared scenes, but it’s so clear that they’ve both been “friend-zoned” by the other that it’s difficult to envision them as a couple. Perhaps that’s why I much prefer the dramas where they have platonic relationships. This holds true in Lady Sour because the first half of the drama where they were just friends was a lot more amusing and charming than when they became a couple. Still, I would rather they played the couple than Him Law and Myolie. The sparks just weren’t really flying between those two. Ya know what I mean? Even though I’m not particularly fond of Him Law, I didn’t mind his or Eliza Sam’s acting in this. But because Ronolie were there, I also just didn’t care about Him or Eliza. Probably not very fair on my part, but whatever. If you skipped out on Lady Sour, you’re not really missing out on anything. Story-wise, there’s just nothing particularly appealing or inventive about it that makes it an absolute must-watch. There weren’t even enough jokes or laughs in this unfunny comedy that would make it a fun watch. But if you are like me and only want to watch for Ron and Myolie, then you’re in luck because they’re just as charming and loveable as ever. I started watching Lady Sour for Ronolie and only kept watching for Ronolie, and I’m totally okay with that. The theme song, 是你嗎?/Is It You?, is performed by Myolie Wu and Ron Ng. 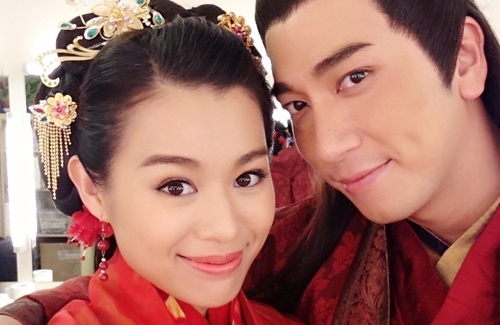 Myolie and Ron most recently starred as a couple in the 2013 TVB drama, Triumph in the Skies II, and both Him Law and Eliza Sam were also part of the cast. Ronolie’s first onscreen collaboration was in the 2003 drama, Triumph in the Skies. Myolie and Ron first met at the 1999 Miss Hong Kong Pageant when she was a contestant and he was still a backup dancer for TVB. They were partnered up during one of the performance segments of the show. How adorable is that?! Both Ron and Myolie will be in the 2015 TVB anniversary drama, Lord of Shanghai, which stars Anthony Wong, Kent Tong, and Wayne Lai.